We all live and work according to our heart's beliefs. Yes, some say that this is the most aspiring thought, and I can stand out to say that our thoughts and thrives are the only things that give us a reason of living. Through out my childhood and teenage life, I always lived by the old tales from our great grand parents. This was the fantasy I enjoyed, especially at night seated surrounding the wood fire back in the village, where smoke marked the living. The fantasy tales though failed to introduce me to the heroes of mankind. So not obvious that Adolf is a man of character with much I can learn. I think a hero does not significantly attribute to a character, but his actions and beliefs smash my thoughts to being a person of responsibility. Wait, his dictatorship leadership and belief in his thoughts and wise character made him be the person we all remember. He always relied on his thoughts for making the decisions he made.Yes; I think that made him a successful leader. 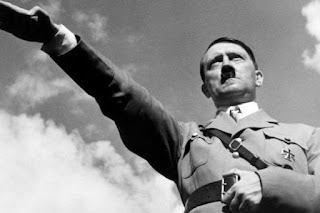 Hitler stayed steady, Those who want to live, let them fight, and those who don't want to fight, do not deserve to live. I yearn to stand and fight, a war so great that many will remember me. Become a legend, wipe out millions and billions. I don't see why man should not be as cruel! Saving our planet by lifting people from poverty of their minds. Most important, spread love and hope to many hearts. If only I had Hitlers courage. A great mentor when you focus on his motivation.